See the full Corporate Cabinet at CorporateCabinet.org. While several of Donald Trump’s picks have criticized the agencies they are now being tapped to run, Rick Perry is perhaps unique in calling for the agency he is to head — the U.S. Department of Energy — to be eliminated altogether. Pro-energy industry Perry was the governor of Texas from 2000 to 2015, and for two years before that served as lieutenant governor under then-governor George W. Bush. Perry was a Republican presidential candidate in 2012 and 2016. 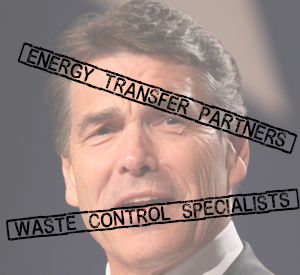 As governor, Perry’s energy policy in Texas was pro-coal, pro-oil, pro-fracking and pro-nuclear waste. He sharply criticized the Obama administration’s Clean Power Plan, which sought to lower carbon emissions from coal-fired power plants, and sued the U.S. Environmental Protection Agency on behalf of Texas as part of a state effort to block the plan’s implementation. He has been an outspoken denier of the scientific consensus surrounding human-caused climate change. Until January 2017, he sat on the board of directors of Energy Transfer Partners, the corporation behind the controversial Dakota Access Pipeline. Perry is or recently was a member of the board for Sunoco Logistics Partners, an energy company planning to purchase Energy Transfer Partners. The CEO of Energy Transfer Partners, Kelcy Warren, was the finance chairman of Perry’s most recent presidential campaign and contributed more than $6 million to PACs backing Perry for president. As a candidate for state and federal office, Perry has received $11.7 million in contributions from the fossil fuel industry. He promoted and permitted a low-level radioactive waste site in west Texas owned by his second-largest donor, Harold Simmons. Waste Control Specialists is seeking to expand this site to “store” deadly high-level radioactive waste, a goal that Perry championed. The U.S. Department of Energy will write the rules that will determine where this waste can be stored. For Earth Day in 2006, Perry endorsed TXU Energy’s plans to build 11 new coal plants, even making the ludicrous claim that air pollution would be reduced if these plants were approved. Perry was criticized during a 2011 presidential debate for accepting campaign contributions from Merck after he had signed an executive order mandating HPV vaccinations, which Merck makes. At the time, he had accepted $28,500 from Merck over his political career. Public Citizen is a national, nonprofit advocacy org that has been standing up to corporate power and holding government accountable for 46 yrs.